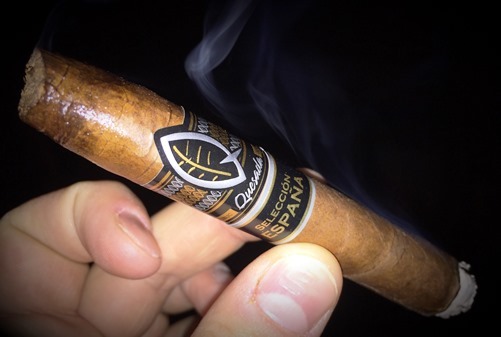 A little over a year ago, it was announced Casa de Montecristo (CDM)—a successful three-location tobacconist in Chicago—would be receiving two exclusive sizes of Quesada’s Selección España blend. These vitolas joined eight other Selección España frontmarks, some of which are regular production, others limited to as few as 600 total cigars. The two CDM sizes are Fabulosos (7 x 54, $12) and the subject of today’s review, a cross between a belicoso and a lancero called Beli-Lance (7 x 40, $12). CDM received 3,000 of each size from Quesada. Each comes complete with an Ecuadorian Arapiraca wrapper, a Dominican Broadleaf binder, and filler tobaccos from Nicaragua and the Dominican Republic. Clearly, Selección España is not exclusive to Spain. Quesada’s retailers in the U.S. got a hold of some samples when the cigar was being introduced in 2010, liked them, and ultimately got approval to bring the blend to the American market. The Beli-Lance from CDM sports a lancero frame topped by a sharply pointed cap. The cap clips uneventfully to yield a clear cold draw, which is somewhat surprising given the thin ring gauge and firm feel. The unique wrapper (Arapiraca is typically grown in Brazil, not Ecuador) is moderately textured and reddish with a few large veins and tight seams. Once lit, pre-light notes of molasses and hay transition to a woody, meaty profile with hints of oak, char, peppery spice, clove, and leather. The body is medium and the smoke texture is thick and chewy. After a quarter-inch, the spice increases, but traces of sweet cream and roasted nuts fade in and out for some balance. At times, the resting smoke is incredibly aromatic and mouth-watering. As the Beli-Lance progresses, the draw tends to tighten and the flavors take a turn towards a bitter, somewhat stale, version of their former selves. From the midway point on, I find myself in a struggle to keep the cigar lit while preventing the taste from becoming too hot or too harsh as the foot heats up from my frequent puffs and touch-ups. I was rarely able to regain the pleasant, balanced profile that characterized the beginning. Notwithstanding the high regard in which many hold Quesada Selección España, I did not have a satisfactory experience with the Beli-Lance, a size I thought I was destined to thoroughly enjoy. All things considered, this cigar earns a disappointing rating of two stogies out of five.